Plastic curtains: they come in all shapes and sizes! It doesn’t matter what size your door or window is we’re sure to have the right size of plastic curtain for your needs. Our plastic curtains currently come in the following dimensions: 200mm x 2mm; 300mm x 3 mm; and 400mm x 4mm and we would generally advise thicker panels for high-usage areas. We also offer ribbed panels, which come in 300mm x 5mm or 400mm x 6mm, to help maintain good visibility in areas where they are likely to be scratched. Depending on your needs our plastic curtains can be ordered either with clever ‘hook-on’ or ‘bolt-on’ fixings. Bolt-on panels offer you additional sturdiness, whilst hook-on panels make replacement easier as you can order the exact number of panels you require. For high-usage areas where you wish to avoid driving through your plastic curtains we can provide a sliding system option designed with an additional track attached to rollers, allowing you to move the curtains as and when you need to. It doesn’t matter which type of plastic curtain or industrial system you need, our team is ready to help and we offer a nationwide installation service. 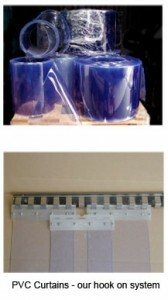 We are also happy to dispatch our curtains ready for you to assemble them yourself. However, should your curtains need additional steelwork, or you choose a sliding option, we will need to give you a helping hand and install the curtains ourselves. 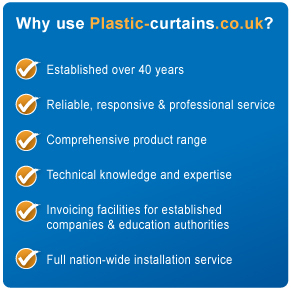 If you need more information, or would like to have a chat about your plastic curtain requirements, then please call us on 01625 573 971. Where can I get discount PVC curtains? 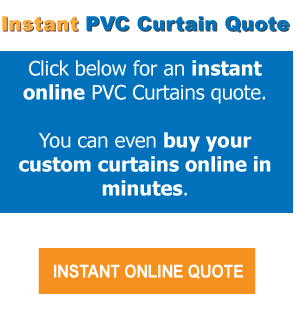 Why should I choose plastic-curtains.co.uk to buy PVC curtains?